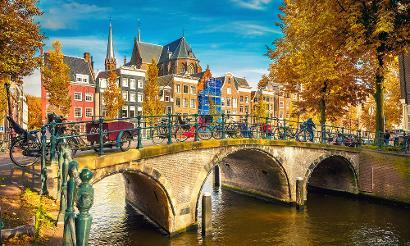 Journey along some of Europe's greatest rivers and canals to some fascinating, historic cities. Explore colourful Amsterdam, and Bremen's delightful old town. Visit Hamburg, "wonderful" Copenhagen, pretty little Aalborg and the little-known resort of Kristiansand on the southern tip of Norway. Make your way to London Tilbury to board Astoria. You'll sail early this evening and enjoy your first dinner on board. 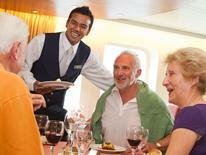 Get to know the cruise staff and some of your fellow passengers before you retire to your comfortable cabin. This morning Astoria sails up the Ijmuiden Canal to Amsterdam. Spend the day wandering the cobbled canal-side streets of this city of waterways, flower markets and renowned museums, and perhaps take to the water on a canal cruise or a self-pedalled canal 'bike'. You'll also have the opportunity to join our optional excursion to the gardens at Keukenhof before you return to the ship. After a day spent cruising along the gentle curves of the River Weser, Astoria arrives in the historic city of Bremen, home to magnificent St Peter's Cathedral and exquisite, UNESCO-listed Market Square. Join the shore excursion into the city to spend your day exploring the narrow, cobbled streets of the Schnoor, the oldest in the city. Today Astoria cruises into the mouth of the River Elbe and docks in the great German port-city of Hamburg. Head ashore to soak up the atmosphere of this vibrant metropolis, or enjoy an evening on board before Astoria sets sail late tonight. This morning Astoria will make her transit of the Kiel Canal, which connects the Baltic with the North Sea, saving over 250 miles' sailing around Denmark. Stylish Copenhagen, home to the famous Tivoli Gardens, and forever associated with Hans Christian Andersen, is our next port of call. Despite its reputation as a young and thriving metropolis, its actually one of Europe's oldest cities, with a rich history reflected in its splendid buildings and ancient streets. Astoria's second Danish port is Aalborg, set next to the Limfjord. Explore the delightful old town's 17th-century castle and painted buildings, or join an optional excursion to the Viking burial site at Lindholm Hoje. Aalborg is also the home of Aquavit, and a visit to the distillery and museum provides another enjoyable diversion. Today we'll stop in Kristiansand, Norway's fifth city, on the country's southern coast. One of Norway's most popular tourist destinations, Kristiansand is renowned for its beaches and Palmesus beach festival, its thriving creative arts scene, and as the home of Norway's largest zoo. Today is spent at sea, making the most of the on-board amenities as Astoria cruises home. This morning Astora arrives in Tilbury, and it'll be time to bid farewell to the ship and her crew as you disembark.